The almost daily news reports of police brutality toward African Americans, and the #fergusonoctober mobilization had me thinking about my 18th birthday. I know that probably sounds pretty random, but bear with me. My 18th birthday presents included a case of beer split among friends (18 was still the legal drinking age in Hawai’i in that year), and a beat down at the hands of police officers who stopped me on my walk home from the party. The beating I took was so brutal that I was physically unable to speak for days afterward. These cops were, like the cops of Ferguson, white public employees carrying around stereotypes and guns in an almost all brown town. The lead officer said I fit the description of someone who busted up a nearby bar – “young, black hair, brown eyes, some kind of local…” and then, when I responded to being put in a headlock by saying “I know my rights,” they proceeded to give me a lesson in the difference between my “rights” and their privilege as foot soldiers of a legal establishment in which I, as an individual citizen, was merely a minority shareholder. A few years later, I moved to Oregon where I went from being “some kind of local” to “that nice Oriental man.” I quickly learned that I no longer fit within the criminal profile of local law enforcement. 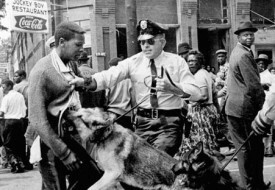 I would no longer be followed around in stores if I shopped in the “wrong” kind of clothes, and cops would rarely feel the need to remind me that I was on the downside of an unjust power relation I would be unwise to challenge. In a society where interactions with the police can end up lethal, the switch from “delinquent” to inconsequential was a considerable improvement. Yes, I realize that what I am referring to as an “improvement” comes at the price of being culturally emasculated and trivialized. But being alive to fight another day is, IMO, an improvement over being killed with my hands up in surrender. But regardless of the relative safety in which I currently live, I recall the details of the night of my 18th birthday every time I hear of another case of racial profiling resulting in brutality or death. I remember it as well when I contemplate the over-representation of Asian women among victims of human trafficking, and the over-representation of Asian American children among those bullied in school. 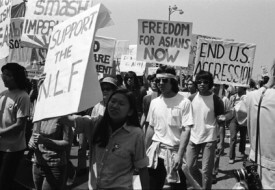 I think of it when I read histories of Japanese American internment, of anti-Chinese persecution and exclusion, and when I consider the fear in which the 1.3 million undocumented Asian immigrants in the United States live daily. And, always, it is on my mind when I cringe over reports of the growing Islamophobia among the American public, and the resulting bigotry and persecution faced by Arabs, Middle Easterners, and South Asians in the U.S.
Injustice is, ultimately, always, enforced with violence, and institutional injustice is enforced with state violence. Whether or not I or “we” are the target, the fact that the death toll in what sometimes feels like a war against Black communities continues unchecked is an indication of a failure of democracy, and a reminder of continuing injustice. Both that failure and the injustices it allows are threats to all of us. When I was beaten on the night of my 18th birthday, my bruises were meant to serve as a warning, not just to me, but to others like me who dared to challenge authority. When those who are racially profiled as criminal are terrorized, brutalized, even killed by agents of state power, we should read these incidents as warnings. All of us who face injustice are being put on notice. But to duck and cover will do no good. Our silence will not protect us. Should the U.S. Institute A Travel Ban to Deal Effectively With Ebola? Thank you. I read the article back after seeing this comment and I see where your caveat comes from. I did not mean to imply that the majority of police officers in Hawaii are white. It’s also important to note that I’m in my 50s. My story is old, very old. The police officers I faced on that night went into the police force via the military. More to the point, whatever the race of the cops, the arrest and imprisonment rates and the types of crimes for which people are most often imprisoned in Hawaii indicate a likely combination of racial profiling and a racially defined hierarchy of economic opportunity. But, that said, I actually don’t want to make the point that police officers are racists. In fact, I think if that’s the conclusion we walk away from Ferguson with, we will have failed to drill down to the roots of the problem. Cops are just public employees with a job to do. The concerns we should be addressing where police officers are concerned are, why are their jobs defined as they are, why are they trained and equipped as they are to do those jobs, and why is legal repression our only solution to the problems cops are supposed to manage? Well i wouldn’t say officers in Oregon are indifferent to Asian people. My cousin left one block from his brother’s house near 82nd and stark 10 years ago when a cop pulled him over. Asked for his registration and then said the car wasn’t his. That’s when he pulled my cousin out and beat him. Days later several officers came to his brother’s house to explain why his brother ended up the way he was. I don’t trust the police anywhere. I always make sure if a cop is pulling me over, I’m in a place a lot of people can see. Not saying all cops are bad, you just never know who you’re going to run to.